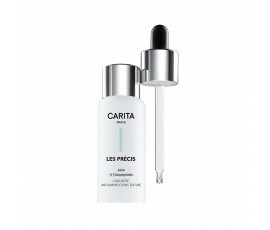 With Les Précis, Carita focuses on the condition of the skin, that changes with hours, days and seasons. Les Précis are 4 handy and fast solutions to be used in combination with the usual beauty routine for satisfying any skin need occurring throughout the day; they can be used as daily boosters or as monthly treatments for more visible results. 4 simple but effective professional treatments. Enriched with fine active ingredients (AHA, Vitamin C, Hyaluronic Acid and Marine Glycopolymer), these 4 concentrate products effectively hydrate and smooth while shining and toning your face for longer-lasting perfect results.